There have been a few standout performances on DJcity’s MikiDz Show over the years, but Monday’s episode with Teeko was one of the most innovative. The Bay Area native’s set featured skilled turntablism, soulful instrumentation, and raps from special guest Aziz the Shake. Teeko’s setup was also unorthodox, as it consisted of a Vestax Controller One turntable, Native Instruments Z2 mixer and F1 controller, Roland Gaia synth, and talk box. There’s a reason why legends like DJ Jazzy Jeff, A-Trak, and Shortkut have praised Teeko, and on Monday he showed it once again. Watch Teeko’s set and interview below and download the audio on iTunes. Acclaimed turntablist and producer Teeko will make his debut appearance on DJcity’s MikiDz Show on Monday, September 19. While most famous turntablists are known for their skills, Teeko is also renowned for his creative approach to DJing. The live stream will begin at 7 p.m. PST and include opening and closing sets from hosts MikiWAR and DJ Dainjazone. Watch a couple of Teeko’s most recent videos below. Back in September, San Francisco turntablist Teeko delivered an innovative performance for Revolt TV’s “1s and Tuesday” segment. The video has since become the show’s second most-viewed routine and now Teeko has returned to showcase his impressive talents for A-Trak’s revered “Short Cuts” series. Watch below as he live remixes A-Trak and Milo & Otis’s “Out the Speakers” with a Vestax Controller One turntable, Native Instruments Z2 mixer and F1 controller, and Sequential Six-Trak synth. Note: the remix isn’t available to download but Teeko told us he might drop it soon. Teeko’s performance last week on REVOLT’s “1s and Tuesday” was truly one-of-a-kind. Joined by a member of his own electronic funk band B. Bravo, the San Francisco DJ/producer delivered three-and-a-half minutes of turntablism meshed with synthesizer funk. Props to Teeko for thinking outside the box and bringing a different vibe to the segment. 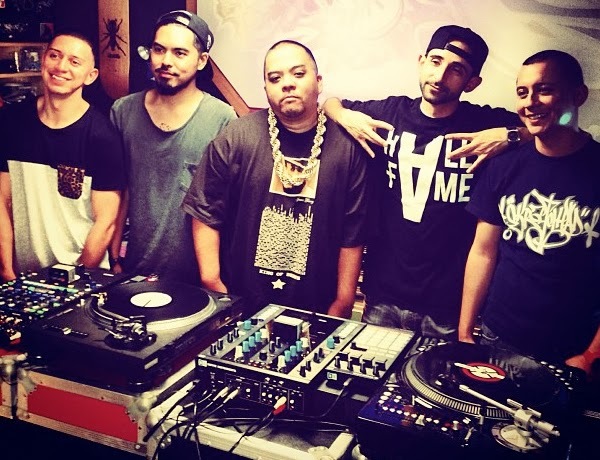 Last year, Teeko was featured in DJcity’s San Francisco edition of the “Cutting Room” featuring fellow Bay Area turntablists Shortkut, J. Espinosa, Miles Medina, and Primo. “1s and Tuesday” is a weekly segment curated by DJcity which showcases turntablists. Previous guests include DJ QBert, Chris Karns, Jayceeoh, Four Color Zack, DJ Spider, DJ Dynamix, Miles Medina and others. Watch “1s and Tuesday” every week at 2pm and 5pm PST. Last month, San Francisco’s Teeko threw down an impressive set for Boiler Room packed with originals, collaborations, and live remixes. The 45 minute performance was further proof that his controllerist skills are on the level of masters such as Enferno and Shiftee. For those who don’t know, Teeko was a co-designer of Vestax’s Controller One turntable. He was also featured in DJcityTV’s San Francisco episode of the “Cutting Room” last October.